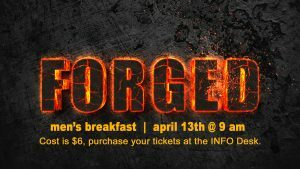 Forged Men’s Breakfast is January 19th at 9am. Cost is $6 – Invite your friends! Sign up at the Info Desk on Sunday or at the door.